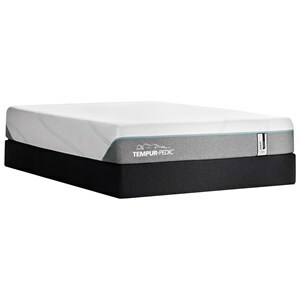 Opulent in comfort, this firm tight top mattress is everything you have been searching for in a mattress and more. Different layers of comfort and support make it easy to drift off to sleep and awaken feeling refreshed and revitalized in a way you have never been before. The Sealy Stability™ Coil with new encased coils help distribute motion so the movement of your partner does not awaken you from your sublime slumber. Solid Edge™ HD provides two and a half inches of full PE foam edge for more perimeter support that you are sure to love. The Gel OrthoZone® II made up of Contoured poly foam provides you with the perfect tantalizingly refined night of sleep every night, making restless nights of sleep a thing of the past. The Sealy Brand Level 3 Queen Plush Faux Euro Top Mattress and 5" Low Profile Foundation by Sealy at Thornton Furniture in the Bowling Green, Alvaton, Glasgow, Scottsville, Franklin area. Product availability may vary. Contact us for the most current availability on this product. The Sealy Brand Level 3 collection is a great option if you are looking for Mattresses in the Bowling Green, Alvaton, Glasgow, Scottsville, Franklin area. Browse other items in the Sealy Brand Level 3 collection from Thornton Furniture in the Bowling Green, Alvaton, Glasgow, Scottsville, Franklin area.